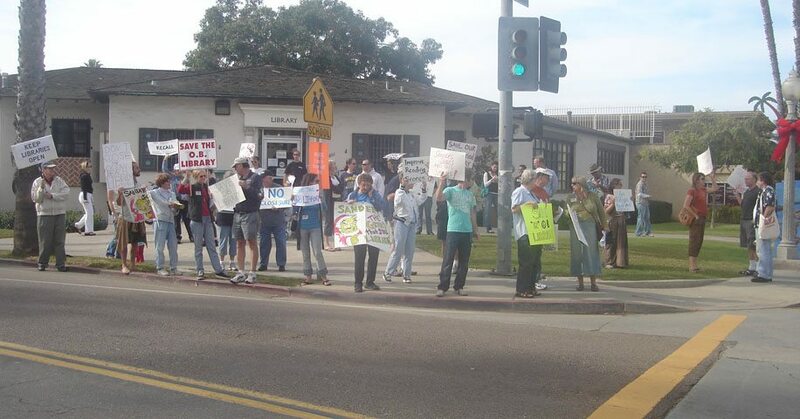 November 22, 2008, rally to save the OB Library. However, the poll showed an ambivalence toward having local branches, as 21% wondered why it was important to have branches close to each other as much as a mile and half (the asserted distance between OB and Point Loma branches). 2% (actually only 1 vote) said that there are more important government services than libraries. Yet no one voted for the response that they don’t use or care for libraries. And that 12% who wanted to use a supposed amount of $200 million slated for the downtown new library shows a weakened support for a central one. San Diego Mayor Jerry Sanders has prosposed cutting back days at the City’s libraries, including the Ocean Beach branch, in order to balance the City’s budget. What do you think? 1) 3 days a week is better than a closed library. 2) My family and I depend on this library. Reduced hours are a hardship. 3) There are more important government services to keep going than libraries. 4) The library budget is being cut again? Unbelievable! What is the Mayor thinking? 5) Don’t really use or care about libraries. 6) I’m ready to commit civil disobedience if necessary in order to keep our branch open. We cannot determine who voted or where they live, of course. Plus, any “answer” added by a reader guest during the course of the poll could not voted upon, naturally, by those who voted before. Older Article: The OB Holiday Parade – So much fun, it should be illegal!